This post is also inspired by the excellent book by Robert Banks – Towing Icebergs. This book would make a great investment if you want some novel ideas for a maths investigation. The challenge is to design a parachute with a big enough area to make sure that someone can land safely on the ground. How can we go about doing this? Let’s start (as in the last post) with some Newtonian maths. We now rewrite things to make it easier to substitute values in later. 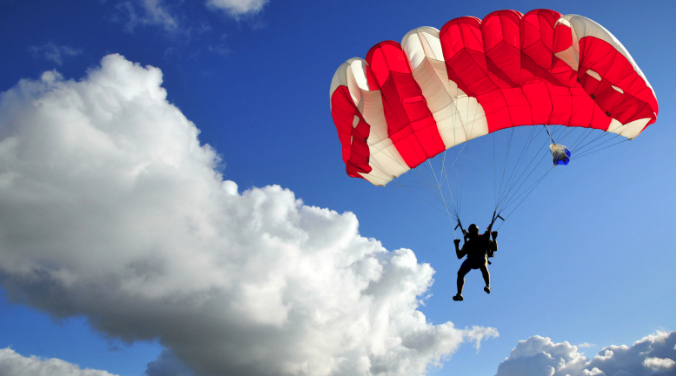 Now, the key information to know when looking at a parachute design is the terminal velocity that will be reached when the parachute is open – that means the maximum velocity that a parachutist will potentially be hitting the ground traveling. Now we need an equation for FD (the drag force). So we are finally ready to solve our equation. We want to find what value of A (the area of the parachute) will make us land safely. So if we had a circular parachute with radius 1.7m it should slow us down sufficiently for us to land safely. Could you please do my maths exploration? Oh, I want you to do mine, also!